Find the best modem for your COX home network! Are you a cable customer getting your internet from Cox Communication? If you are, and are looking to get a boost to your internet speeds as well as get rid of that monthly fee, these third-party modems can provide an excellent solution! This hardware will be able to improve your internet connection while remaining free from the Cox rental fees. What better way to get faster internet than free of charge! 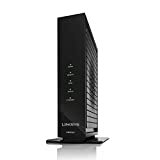 The modems in this list can help your internet connection to run faster alongside your router, as they tend to function much better than many of the rentals provided by internet service providers. You'll surely find the best modem for Cox in this list! Then you'll have the networking hardware to leave others in the dust. There are plenty of aspects worth keeping in mind when looking for the ideal modem. You'll want to take into account the kind of speeds that the modem can allow for, as well as the warranty backing you up. Furthermore, considering the kind of connections you'll have available is a great idea. 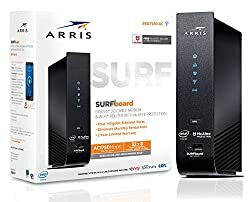 In addition to a lightning fast modem, the Arris Surfboard SBG7580AC offers a built-in Wi-Fi router. This AC1750 is great for combining the abilities of both a router and modem into one convenient device. As a result, you'll be able to save money, space and the time it takes to set up multiple pieces of hardware. Furthermore, your entire network will be able to rely on the ARRIS Surfboard as a single hub. Consequently, the setup and control processes are going to be a lot easier. In addition, you'll get the benefit of added security with McAfee software, which comes free with the purchase. On top of that, the ARRIS Surfboard is able to provide ipv6 and ipv4. As a result, you'll be able to get a better experience and an internet connection that is more effective. There are also four Ethernet ports available, each one-gigabit. Overall, this is an ideal option for those who want a combined device. In addition to the Arris Surfboard itself, you'll also get a warranty for a 2-year period. Overall, you can rest assured that your internet will provide a much better connection for you while revolving around this machine. While many can find this to be a very useful option, some can find that the chipset it's built with might fail. This can be a concern for those who want a device they can rely on for many years. In addition, others may notice that it has a bad habit of dropping packets. Saves money over rental fees. Can improve your connection speeds. Great for meeting streaming needs. Some customers may find that it has a problem with dropping packets. In some cases, the chipset may fail. If you're looking for a fantastic overall option at a decent price, this is worth trying out! 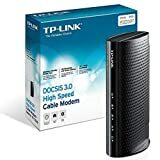 If you're on the hunt for something that comes at a more affordable price and is able to provide a faster, more reliable connection then the TP-Link TC-7620 is a great way to go. It offers better internet connections and also provide you with speeds of about 686Mbps. In addition, this is an option that is significantly less expensive than other models out there. The TC-7620 offers a price that is budget-friendly and still able to reach some pretty decent speeds. It's also a device that provides DOCSIS 3.0, which is technology certified by CableLabs. For those who are concerned about backwards compatibility, the TC-7620 is able to make use of service providers that offer 1.1, 1.0 and 2.0 feeds. As a result, it's an option that is considered to be rather future-proof. Many who try out this device find that the LEDs are clear and informative, allowing you to be able to see what's going on easily. It's also able to offer dual-stocking as well as technical support that is available 24/7. Overall, it's an ideal budget choice! If you decide to try out this device then make sure to keep an eye on it while it's in use, because it can run hot at times. This can cause problems for the connection and cause the device to wear down too quickly. Some others can find connectivity problems without apparent cause. Provides higher speeds at a lower cost when compared to rental devices. Some users can experience connectivity issues. This device can run hot. 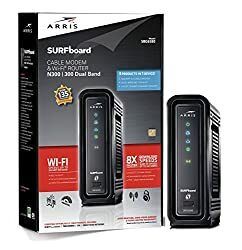 If you're looking for something that can replace a rental modem and fit into a tight budget, this is a perfect choice. For those who want a serious download rate, the Netgear CM600-100NAS is able to provide rates of up to 9960Mbps. That's quite a lot to boast when it comes to connection speeds! On top of that, you'll be able to connect your device through hardwired means using the gigabit Ethernet port. As a result, that connected device will be able to achieve faster access in a simple, convenient way. In addition, the slim design of this Netgear device allows it to avoid taking up a great deal of space. While it can sometimes run hot, it's overall a great option for gaming at high speeds. Furthermore, the Netgear makes use of indicator lights that are designed to be helpful rather than annoying. As a result, they aren't bright enough to keep you from sleeping at night, but do have just the right amount of intensity so that you can see what's going on. So you won't have to worry about staying up too late due to the lights! Whether it's streaming or gaming, this Netgear device is a truly solid choice. It's compact, therefore not using much space and it's small enough to avoid becoming an eyesore. Overall, it's an ideal option for a variety of reasons. There can be some problems with this device in that it begins to require frequent rebooting in order to allow for the most efficient connection. Some other customers find that they would prefer a device that can be controlled through remote means. This is an aspect worth keeping in mind if you're interested in this device. Keeps you from paying rental costs. Some customers can find that it can’t be managed remotely. There can sometimes be issues where the device needs frequent reboots. If you're looking for something that is reliable, useful and absolutely capable then this Netgear modem is a fantastic option, well worth a little bit of an added splurge! This is a Cox-compatible option that comes at a fraction of the cost when compared to other modem models. As a result, the D-Link DCM-361 is one of the top options on the market today. It's also an option that is able to provide speeds that are more than adequate for many online activities. Furthermore, you can expect the DCM-301 to deliver around 320Mbps to your connection, giving it a boost over some other options out there. The process of installation is known to be very straightforward for this device, so you won't need to worry about getting a headache in the process. It's truly an option that can meet the needs of most users. That said, if you're interested in this option, then it will be important to remember to clear out the area around the vents on the DCM-301. This device can have a tendency to heat up pretty easily, which can sometimes cause a problem. However, it is also an option that can work with cable providers other than Cox. Overall, many users have had good things to say about the DCM-301. Many find that it's easier to keep in small spaces than some larger options. However, some customers have found that the web interface it uses can be somewhat lackluster. Some users have been finding a problem with this device in which it tends to overheat too easily, causing problems for the connection and the customer. In other instances, it may need to be rebooted often in order to keep your internet connections working well. Some users can find it needs frequent resetting to continue working well. The D-Link is a device that comes at an affordable price and is very easy to install and use for many customers. A connection that is interruption-free is ideal for most internet users. The good news is, that's easy to achieve with the help of the Netgear Nighthawk X4S. It's made with a processor that is high-quality and an AC-3200 router is built into the device to make sure you have everything you need. As a result, you'll have full control with this device and a lot of customization options. Furthermore, the X4S uses DOCSIS 3.1, which is a brand new technology allowing you to stay on the cutting edge. Thanks to this addition, the reliability and speed on this machine are improved greatly. You'll also get the help of 32 downstream channels that are bonded to ensure the best quality. As a result, they're able to help with the slack during peak hours when things might be extra busy. There's no denying that the X4S is able to provide a lot of features, from the added speeds to the new technology, this machine has your back. When compared to other models out there, it offers trememdously improved features that will ensure you never want to use anything else. Overall, if you're looking to pick up a truly reliable device, the X4S is the ideal answer. It's an effective combination device, and it's able to provide some really great connection speeds. While many find themselves to be big fans of the Nighthawk X4S, some users can find that connections may slow or cease altogether unexpectedly. As a result, it's a good idea to make sure you have all warranty materials available so that you can contact customer service for a resolution. Provides a more reliable network. Compatible with a variety of ISPs. Some users can experience lagging and slow connections. In some cases, the device can cease being able to connect to the internet. If you don't mind spending a bit more, the Nighthawk X4S is an ideal high-end modem/router that will surely be able to cover your internet needs. When features like high speeds and convenient gigabit Ethernet ports are at the top of your list, the Motorola MB8600 is a solid way to go. This device is able to reach some extreme speeds, allowing your internet connection to move more smoothly. Consequently, it's definintely a device that is worth trying out! Due to the long lifespan and attractive housing, the MB8600 is a favorite of many who are looking for something reliable. It makes use of the latest DOCSIS technology and is able to work with a variety of service providers. As a result, it's an ideal option when it comes to versatility. Furthermore, the unit is made to be well-ventilated so that the MB8600 won't overheat too quickly. When compared to some other models, this can be a huge bonus in keeping everything running well. It's also able to provide some solid firewall protections to ensure anyone on the network stays safe. Overall, the MB8600 is a great choice for a variety of cable plans. Just make sure you check with your provider to make sure it's an approved device. Once it's installed, you'll be able to enjoy the reductions in latency and lags in your connection. If you try out this device, it may be worth keeping in mind that some users find that after some use it can require daily rebooting in order to maintain solid connections. In other cases, it may have problems getting connected to your network. Quick and easy to get installed. Capable of increasing internet speeds. Uses the most updated versions of DOCSIS. In some cases, customers can find they need to reboot the device every day. Some customers may have trouble getting it to connect to their network. If you're looking for something with the latest tech and a middle-of-the-road price, this is a great choice. 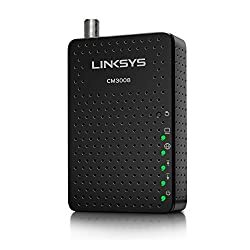 If you're looking for something that can be an ideal choice for streaming HD movies, the Linksys CM3024 is a fantastic way to go. You'll be able to reach speeds of 960Mbps quite reliably, ensuring you get the most from your internet plan. For those who care a great deal about speed, this option is one of the best out there. Furthermore, the CM3024 makes use of a convenient 6 chipset known as the Intel Puma. As a result, it's made to allow for a more plug-and-play design to make the process of installation and use easier on the user. That said, there are some customers who have voiced their concern about this chipset. In addition, you'll be able to get excellent service when you pair the CM3024 with a quality wireless transmission device. In their partnership, they'll be able to ensure that you have access to 24 great downstream channels. As a result, your internet experience will be more coordinated and offer more speed. From the setup to the daily use, the CM3024 is a truly a top-tier machine. It's a solid unit that can provide excellent speeds and all around capability. However, it is important to keep in mind that some users may find that the LED lights on the device are too bright for their liking. For the most part, this is a highly useful device, but some tech-friendly users find that the chipset it uses may be fundamentally flawed. In some other cases, users may experience small issues only to find that customer service is difficult to get a resolution from. Heating and connectivity issues are uncommon. Ensures you get the speeds you’re paying for. Contains a chipset that some customers find to be flawed. Some users can experience problems with customer service. This device presents an affordable, easy-to-use option that can work very well as a replacement for a rental device. This modem not only allows your connection to get to you, but also offers a built-in access point for Wi-Fi. As a result, you won't need to worry about having multiple devices to essentially do one job, as the Arris Surfboard SBG6580 is able to offer long-range access directly from its body. As a result, you'll be able to connect to a dual-band 802.11N connection without a problem. With the SBG6580, you won't have to worry about making any extra purchases or space on your shelf. The setup is simple and you get a good modem and router in one device. You'll also be able to rely on this combination to provide speeds of 343 Mbps. Furthermore, to keep your experience as ideal as possible, the SBG6580 includes Gigabit Ethernet connections, using 4 ports so you can connect several devices. You'll also be provided with high-quality security that you can rely on to keep you safe on the net. Do keep in mind that some customers find that the link light can be a bit distracting while it blinks. Overall, the SBG6580 is a reliable device that may not be able to reach top speeds, but it's great for most situations. 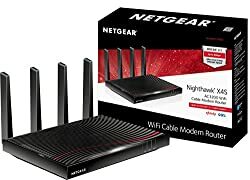 For those who require a connection that can handle basic internet use and some streaming, you'll likely find all you need in this machine. While there are many who enjoy and appreciate this machine, there are some who may find it begins to drop connections unless it is rebooted often. It can also have problems with dropping connections after only a few months of use. It can begin to drop connections only after a few months of use. Can require frequent rebooting to maintain internet connections. For those who want to get away from rental fees but don't need something that is made to provide intense speeds, this is a solid choice. If you're looking for speed, then the Zoom Telephonics 5341J might be your solution. When you connect a device to it using the Ethernet port, the resulting hardwired connection can reach speeds of 1,000Mbps. Consequently, this is a device that is truly able to deliver! In addition, the Zoom is a device designed to help with saving money that normally goes to the rental fees for your rental modem. Rather than just going with what your provider has to offer, you can choose to eliminate that added price altogether while getting better performance in the process. As a result, many find that this is a choice that is perfect for lowering their internet bills. On top of that, the Zoom is able to assist with conserving electricity through the use of a power cube. This device is made to switch as needed to keep the device from consuming more power than it needs to. Consequently, it provides multiple ways to keep more money in your pocket. Furthermore, the Zoom is backwards compatible, allowing it to work with earlier versions of DOCSIS easily. While many find that it's a device that provides easy installation, some users can find that the RF input has been placed somewhat poorly. It's truly a device made specifically for helping you save money and keep a quality connection. Make sure to check this device from time to time, as there can be some issues with it overheating which can result in problems for your connection. Easy to set up with your network. Capable of faster speeds than other options. There can be some issues with the device overheating. After some use, it may begin to require reboots often to keep your connections strong. When you're looking for something simple and reliable, this is an option well worth checking out! If you're looking to get rid of your ISP rental fee, the TP-Link CR700 is a perfect solution. This cable modem comes at a decent price and allows you to eliminate that added cost on your bill. In addition, it's able to provide speeds of 300Mbps to match your internet plan. In addition, this device is certified for use with a wide variety of providers including WOW, Comcast XFINITY, Mediacom, Spectrum, Bright House, Charter, Suddenlink, Cox and Time Warner. The CR700 also offers 4 upstream and 16 downstream channels that allow for the best possible internet experience. It's also able to provide speeds up to 16x faster than DOCSIS 2.0 routers thanks to the DOCSIS 3.0. Overall, the CR700 is able to reach speeds of 1750Mbps, making it an excellent cable modem whether you're replacing a rental or just need something new. For those who prefer the most possible efficiency, this device also combines a router and modem into one machine. The six antennas placed internally also strive to provide class-leading signals. Furthermore, the overall speed is made up of simultaneous bands, made up of a 5GHz band at 1300Mbps and a 2.4GHz band at 450Mbps. For downloads, you'll also have access to 680Mbps, keeping the strength at full boost. Due to this industry-leading design, the abilities of the CR700 seems nearly unlimited. From channel bonding to a reduction in interference overall, there's no denying that the CR700 is a great device. It's able to amplify cable signals and even provides a warranty that lasts 2 years. On top of that, you'll get technical support that is available 24/7. Though there are many who find this to be a useful tool, some can experience issues with customer service when there is a problem with the device itself. Provides the abilities of modem and router in one device. Installation instructions are clear and easy to follow. Works well in larger homes. In some cases, it can begin to drop connections unexpectedly. If you're looking for a device that can provide better performance and range than a rental device, this is an ideal solution.